Make the brownie mix according to the box instructions, adding the egg and oil and mixing until smooth. Add the brownie mix to a greased and lined sprung cake tin and bake for 20 minutes or unti cooked. Then leave to cool. Mix with a beater the cream cheese, mascarpone and cream together, until you have a light and fluffy mix. Then carefully fold in the melted white chocolate and add the mix onto the cooled brownie in the cake tin. Leave to set in the fridge for 2 hours. 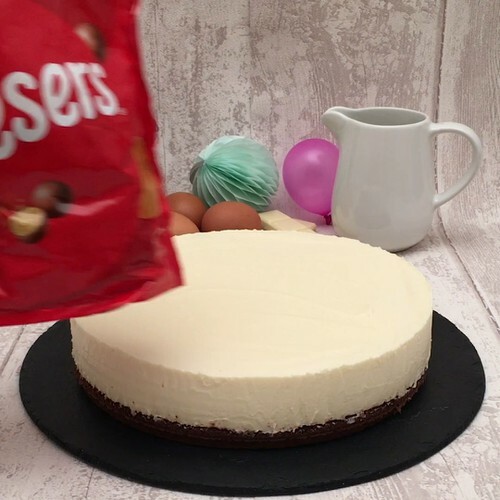 Remove the cake tin and decorate the top of the brownie with the Maltesers, making a circle pattern with them. Cut slices of the cheesecake and serve with chocolate sauce. Enjoy!